The Red Sox have made a pair of minor-league deals. Per Ben Badler of Baseball America, Boston has signed right-handed pitcher Dalier Hinojosa to a minor league contract. Hinojosa defected from Cuba in June. Per Jon Heyman of CBS Sports, Hinojosa received a bonus of $4 million. Because of his age, his bonus will not count against the Red Sox international cap. Matt Eddy, also of Baseball America, reports that the Red Sox have acquired infielder Jimmy Rider from the Pittsburgh Pirates in exchange for future considerations. 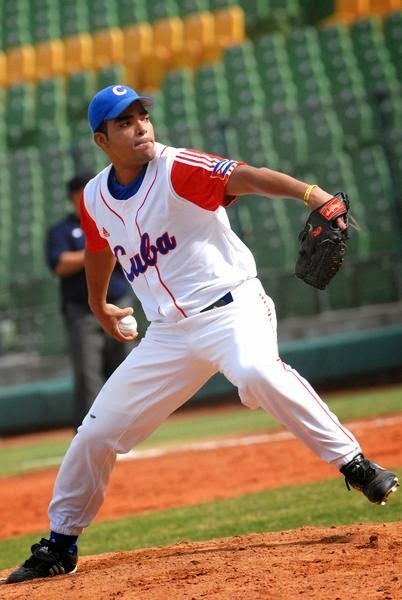 Hinojosa, 27, a 6-foot, 210-pound right-hander, was with the Guantanamo team in Cuba's Serie Nacional from 2005 until he defected this season. Per Jesse Sanchez at MLB.com, he throws a four-seam fastball in the low-to-mid 90s, supplemented by a two-seam fastball, slider, curve, and change. During the 2011-12 season, his final full campaign in Cuba, Hinojosa had a 3.40 ERA in 121 2/3 innings, striking out 115 and walking 35. Though Hinojosa worked largely as a starter in Cuba, Badler projects that his long-term role will be in the bullpen. He projects that Hinojosa breaks spring training in the high minor leagues, likely at Triple-A Pawtucket. Rider, 23, was a 23rd-round selection by the Pirates in the 2012 draft out of Kent State. He split 2013 between Jamestown of the New York-Penn League and West Virginia of the South Atlantic League, hitting .269/.322/.394 in 118 plate appearances. After splitting his time between the two middle infield positions in 2012, Rider primarily saw action at third base in 2013. He is projected to begin 2014 with High A Salem or Low A Greenville. Our friends over at Pirates Prospects have a profile of Rider.